SaintFrancisDam.com HS7038 | St. Francis Dam Disaster | Controlled Burn of Flood Debris, March 1928. 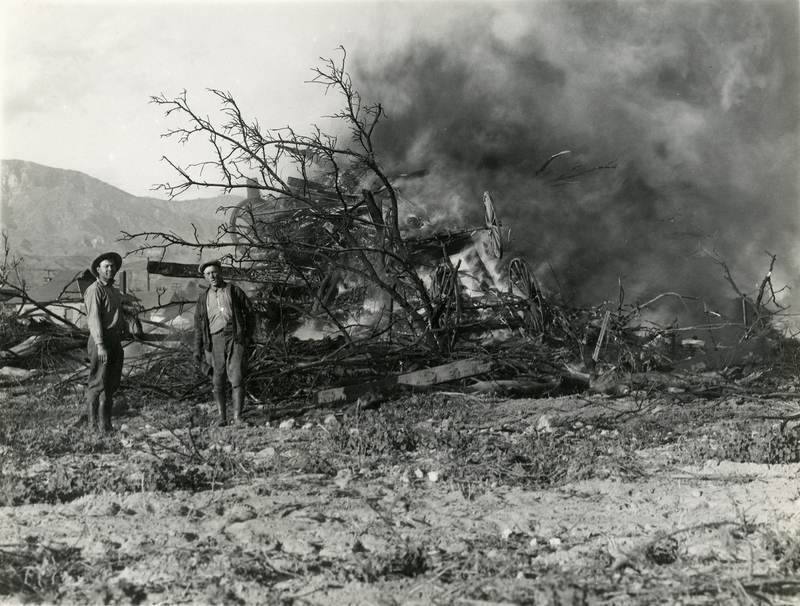 Two men stand by as a pile of wagons and vegetation is set alight in the aftermath of the St. Francis Dam Disaster, March 1928. Location unidentified. Santa Clara River Valley, probably west of Castaic Junction. Could be Fillmore or Santa Paula area; note the row of houses in the background. Historian John Nichols writes: "Because of the number of animal carcasses and other decomposing debris, it was necessary to get rid of these mounds as quickly as possible. ... Oil sprayers were furnished by the State Dept. of Agriculture" (Nichols 2002:83). HS7038: 9600 dpi jpeg from original 8x10 glossy print, SCV Historical Society collection. Stamped imprint on back indicates it was donated by Thomas E. McNeill of Valencia.